Wearing a blue pant suit, Sonakshi attended a dinner hosted by Manish Malhotra and Chandon and the designer’s house. I like the idea of the tassel necklace but to be effective, it had to be a bit longer. I also am not fan of that sports bra-like top. Kareena taped for an interview on Thursday and was seen doing a yellow on yellow look in an Alix bodysuit and Zara pants paired with snake-print pumps. While in theory, I like the idea, the pants weren’t working. A simpler flared version without the front piping and belt hoops might have worked better. Kajol attended the launch of jewellery store that she endorses wearing a Punit Balana anarkali. She looked lovely. Print feel a bit familiar? It’s cuz we saw Janhvi wear a sharara version featuring it. 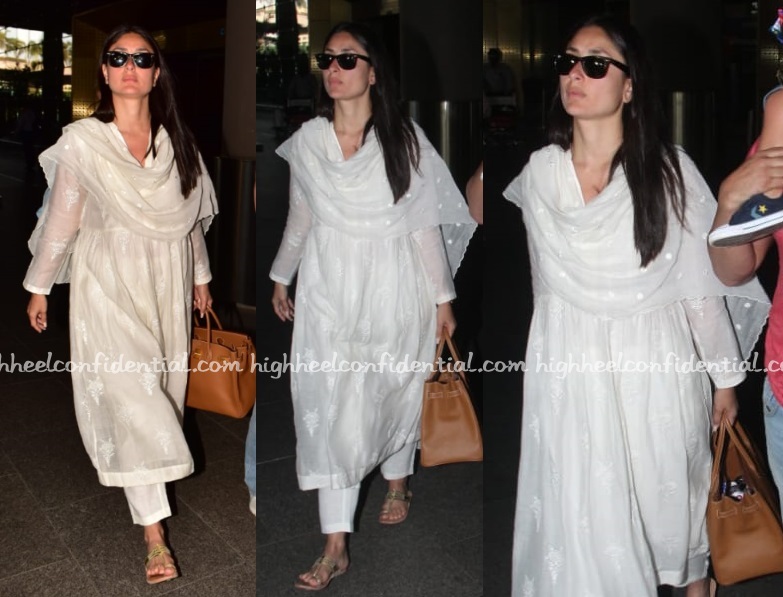 Back after a short trip to Pataudi, Kareena was spotted at Mumbai airport in Good Earth separates, kolhapuri chappals and her Hermès Birkin. She sure looked comfy in the casual outfit.